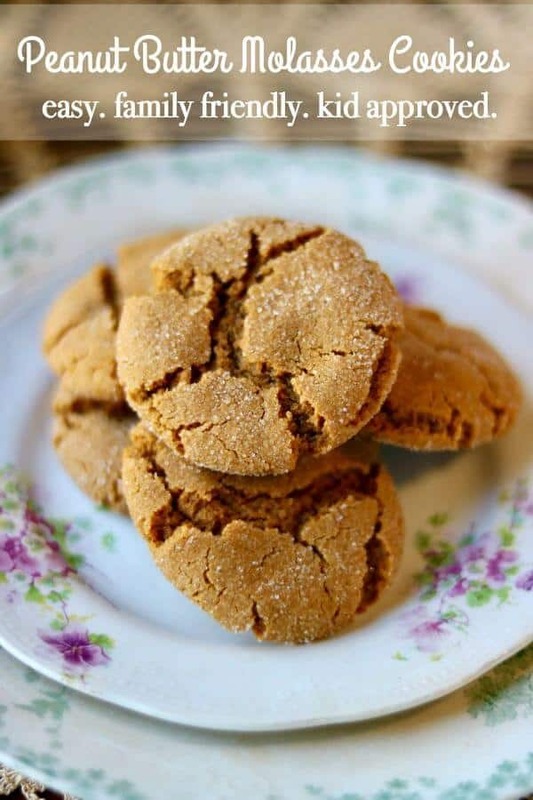 Peanut butter molasses cookies are have a delicate, crispy outside and are chewy inside. 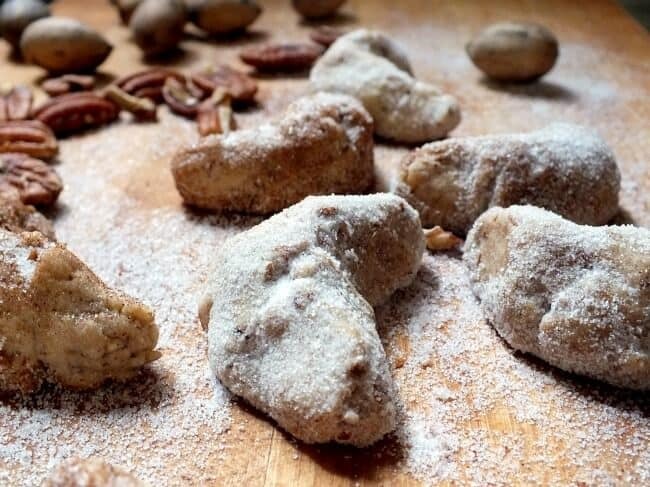 Easy to make, these unique crinkle cookies are perfect for lunch boxes or shipping to loved ones.They freeze well, too! Great for baking with younger kids. When I was a kid I used to love those peanut butter molasses taffy candies that only were in the store during Halloween. I don’t know if you know what I’m talking about but they were wrapped in orange or black waxed paper. I would go for those even before the chocolate! There’s just something about sweet-salty combinations that I love. I wanted to recreate that sweet salty goodness in these peanut butter molasses cookies. I decided to use my molasses crinkles cookies recipe as a base because I know that they ALWAYS come out perfectly. With just a few tries and a few adjustments I came up with these. They’re definitely going on my top ten list along with my ultimate chocolate chip cookies! And they are pretty good, if I do say so myself. They are, in fact, kid tested AND adult tested. Heck, they’re even dog tested, although the cats refused to try. My house has been a little crazier than usual this week -which says a lot because the level of crazy here tends to be off the charts. I mean, can you really measure something after a certain point? My son who is stationed in Korea is home for the first time since Christmas 2015. Y’all remember that, right? All the kids worked together to make sure EVERYONE was here and we got family pictures done… which already need to be updated since my newest granddaughter was born in November. Anyway, he’s back home for two weeks. My oldest daughter is in the midst of a divorce and she and her kids (15, 13, 8) are moving in here while she gets stabilized. They stayed this past week since it was Spring break. All told we currently have 11 people, 4 dogs, and 2 cats living here at the moment. So yeah. Crazier than normal but this is our new normal more or less. My 8 year old granddaughter loves cooking with Gramma. She’s really kind of struggling with all of the changes and so I’ve tried to set aside my schedule a bit to give her some baking time. We whipped up this recipe in no time with me mixing and she rolling the dough in the sugar then placing it on the cookie sheets. This dough is firm enough that the younger kids can help without much problem. As it bakes deep cracks form and the outside gets a crispy coating from the sugar. 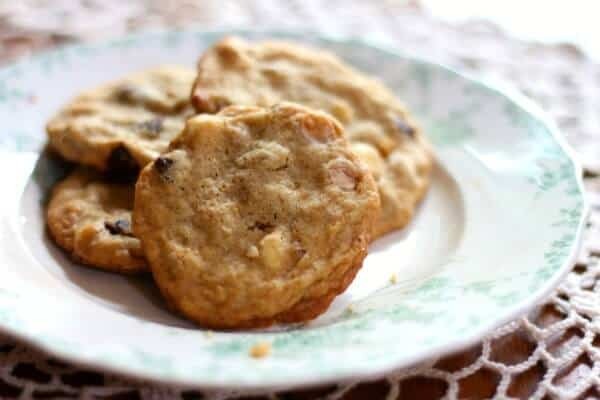 The inside stays soft and chewy but if you like crisper cookies leave them in the oven an extra minute or two. 10 minutes for very chewy cookies, 12 for average, and 14 for crisp cookies is about right. They are so good with a glass of cold milk! One of the kids made ice cream sandwiches out of them, too. Have plenty of these on hand for school lunches and shipping off to loved ones in college or the military. Silicone mats are the way to bake cookies! No sticking, no burning. 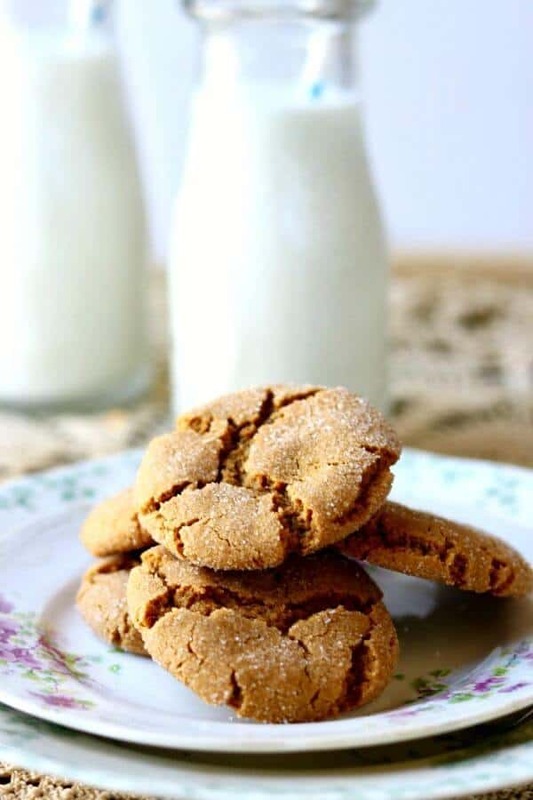 Grandma’s Molasses is the brand I use most often and the brand I used in these cookies. Just makes sure whatever brand you use says “unsulphured” or the taste will be too strong and bitter. 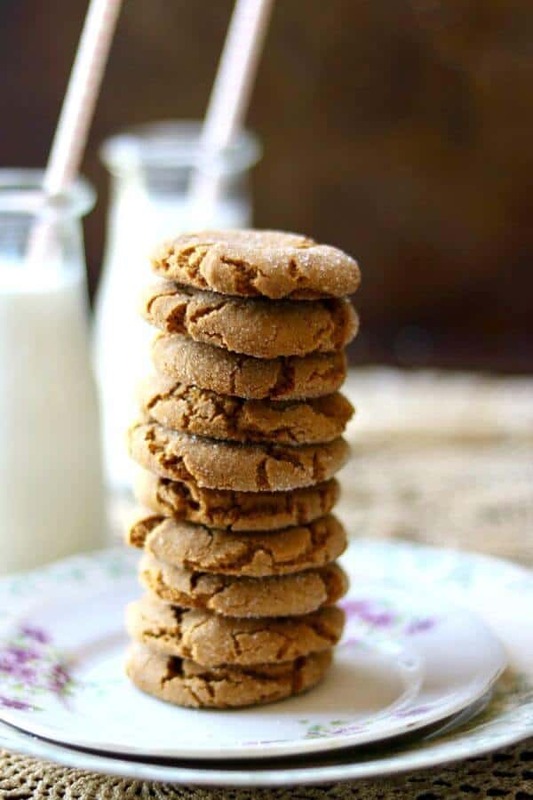 Crispy outsides and chewy insides make these peanut butter molasses cookies a family favorite. Molasses gives a unique favor to this sweet-salty cookie. Perfect for lunch boxes and these ship well overseas, too. Whisk together flour, baking soda, and salt in a bowl until combined. Beat together peanut butter, butter, and brown sugar until pale and fluffy, about 3 minutes on medium high. Roll 1 heaping teaspoon of dough into a 1-inch ball with wet hands. 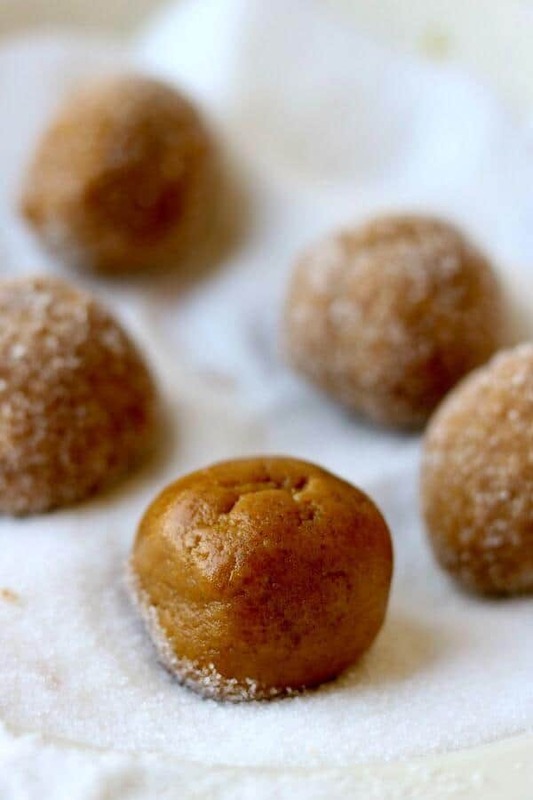 Roll ball in sugar or turbinado sugar to cover. 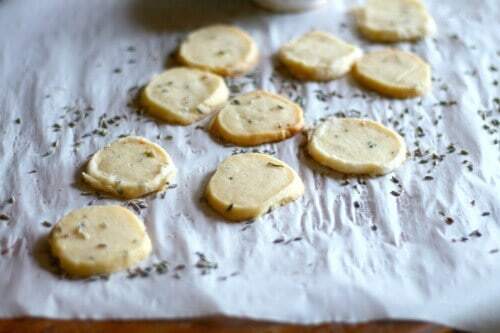 Arrange 2-inches apart on a baking sheet covered with silpat or parchment. Bake cookies undersides are golden brown and tops "crackle", 10 to 12 minutes total. Cool on sheets 5 minutes. Freeze unbaked balls for up to 3 months - just put them on a cookie sheet and put in the freezer until frozen solid. Add to freezer bags so that you can remove as many as needed and bake. Baked cookies also freeze well. Included in Meal Plan Monday Christmas Cookie Edition – Check out all the cookie recipes! These were good, but I think the baking soda should’ve been cut in half – mine came out a bit fluffy. Really? Mine weren’t at all – they were chewy. I wonder if my baking soda was outdated?! We will love your Peanut Butter Molasses Cookies! Thanks so much for sharing your post with us at Full Plate Thursday this week. Hope you will come back and visit us again real soon!